Official website for Santa Claus. Do a little Addition practice Santa style. Do a little Subtraction practice Santa style. Do a little Counting practice Santa style. 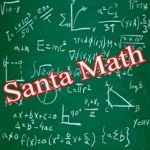 Learn to write your numbers Santa Style. 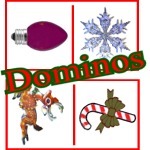 Page one of a set of Christmas Dominos. 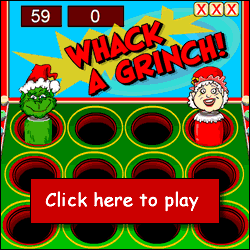 Page two of a set of Christmas Dominos. Click on the Grinches...but not our TAOLF friends! 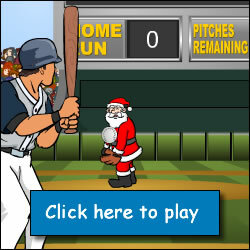 Santa Claus is pitching baseballs and you're the batter. Click on the batter to swing the bat at the right time and you'll get a Home Run! 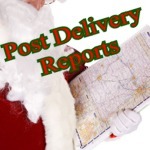 Here is one of Santa's Post Delivery Reports that has been declassified. A declassified report on Santa's health after one of his long delivery nights. 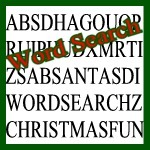 Do you love word searches? Here is one that is quite full of Christmas cheer. Santa loves to do a daily jumble. Here are few of his favorite words jumbled. Can you figure them out? 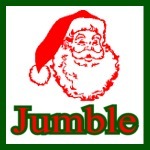 Santa loves to do a daily jumble. Here are few of his favorite reindeer names jumbled. Can you figure them out? 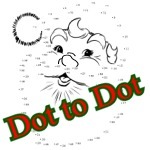 Can you find Santa in this dot-to dot? Do you want to know how man Humans are on Earth? Santa checks this page more than twice when he is prepping for his holiday run!